Words Wealthy Democratic Donors Should Get Used To: 'It's Me, Rahm' : It's All Politics Now that Chicago Mayor Rahm Emanuel is in charge of raising really big dollars for a superPAC that supports President Obama, wealthy Democrats all over the country may be eyeing their phones nervously. Sources tell NPR that Emanuel will be pushing for donations of $10 million and more. Chicago Mayor Rahm Emanuel wants you ... if you're a wealthy Democrat who can write a $10 million or $20 million check. Now that Chicago Mayor Rahm Emanuel is in charge of raising really big dollars for a superPAC that supports President Obama, wealthy Democrats all over the country may be eyeing their phones nervously. Emanuel, the former Obama White House chief of staff, is known for not taking no for an answer and for aggressively going after what he wants. Indeed, he's a ferocious fundraiser who gets to the point, often throwing in an epithet or two for emphasis, just the sort of rainmaker needed by Priorities USA Action, the pro-Obama superPAC that desperately needs cash. The biggest Democratic donors have shunned the superPAC, which can raise unlimited contributions. They've preferred to stay within the regulated, pre-Citizens United campaign finance system. At the end of July, the pro-Romney superPAC Restore Our Future had $20.5 million cash on hand — more than four times the $4.2 million banked by Priorities USA Action. And Romney has the backing of other outside groups with even more money, including the "social welfare" organizations Americans for Prosperity, supported by David and Charles Koch, and Crossroads GPS, where Karl Rove is an unpaid adviser. Until this week, Emanuel was a national co-chair of Obama's campaign. Sources in Democratic fundraising circles tell NPR that Emanuel needs to reach out to the top echelon of liberal donors and persuade them to write checks — not for $1 million, but for $10 million to $20 million. They say that's the only way to build a war chest for multimillion-dollar TV campaigns. And they say most of the money will have to be raised within the next two weeks or so. In the battleground states, much of the airtime has already been sold. 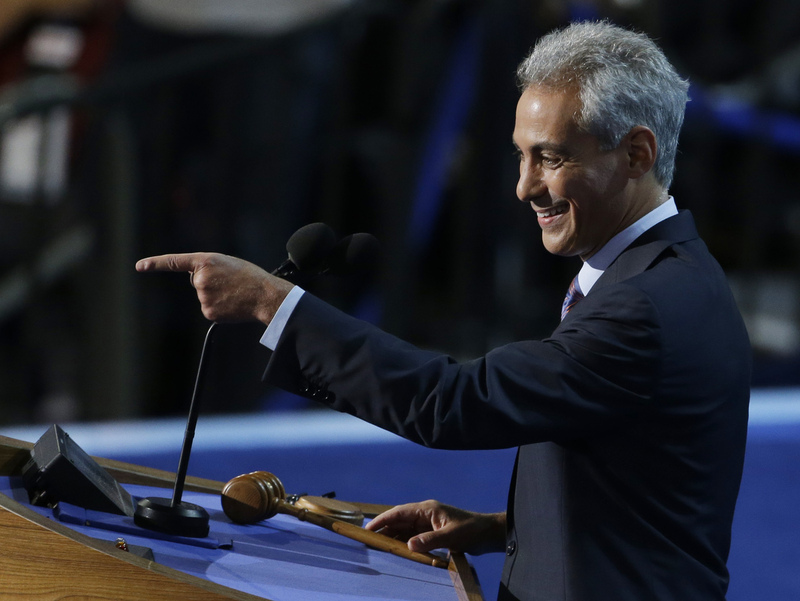 National Journal's Chris Frates reports that Democrats are confident that if anyone can get the job done, it's Emanuel. "Emanuel became the master of calling people: instead of saying thank you when his targets mentioned an amount they were willing to give, he lambasted and embarrassed them, telling them he wouldn't accept that lowly sum because he knew they could do better. And they did." " 'The first third of your campaign is money, money, money,' Emanuel once told a group of staffers. 'The second third is money, money and press. And the last third is votes, press and money.' "
Emanuel is also soliciting for the two Democratic superPACs from Capitol Hill, House Majority PAC and, on the Senate side, Majority PAC. As mayor of the nation's third largest city, a metropolis that not only dominates Illinois politics but also has plenty of business opportunities, Emanuel's phone calls and relentlessness may prove hard for potential donors to resist, especially those who want to stay on his good side.